If there is one thing I learned at Fortune 500 – it is that Gartner is the ultimate CYA for CIOs. New technologies tend to follow different trajectories of hype, hope, and despair as they are discovered by different groups of people and finally adopted (or ignored) by consumers. 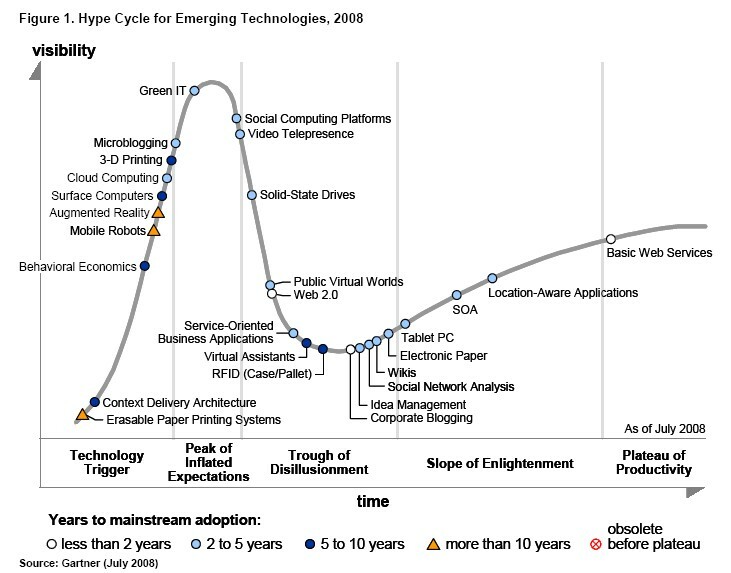 Gartner actually goes ahead and charts this hype cycle for different technologies. Its latest hype cycle for 2008, shown above, is making the rounds. (It was released in July, but is just now reaching the upward trajectory in its own cycle). According to Gartner’s view of the world, the visibility of new technologies peaks early as initial excitement gains steam. This phase is followed by a “trough of disillusionment” in which inflated expectations hit reality. But as technologies prove themselves, their visibility begins to grow again at a more measured pace. Previous Previous post: Great example of communications creating value.